The Government Email System (GovMail) offers the government agencies their own user address which establishes official accounts and emails coming from the agencies. A user@agency.gov.ph address tells people that the person belong to the agency named in the GovMail account. It gives credibility and weight to the email. The GovMail system is in line with the e-Government Master Plan that aims to modernize government processes to improve the delivery of goods and services to the public and promote transparency. Citizens will also benefit in terms confidence and peace of mind knowing that they are dealing with authentic government agencies. 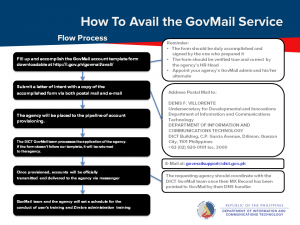 For more information about GovMail, please click this link.